Media captionHow the wines of Canadian winemaker Norman Hardie are winning fans around the world. With winter temperatures regularly dipping below -25C at his vineyard, winemaker Norman Hardie definitely didn't choose an easy place to grow his grapes. "Minus 25 is the absolute death knell for vitis vinifera [the common grape vine], we actually have to bury our vines in the winter [to protect them]. It's a huge job," says the 51-year-old. "And then we can get snap spring frosts that can quickly ruin a crop. We lost more than 80% in 2015." 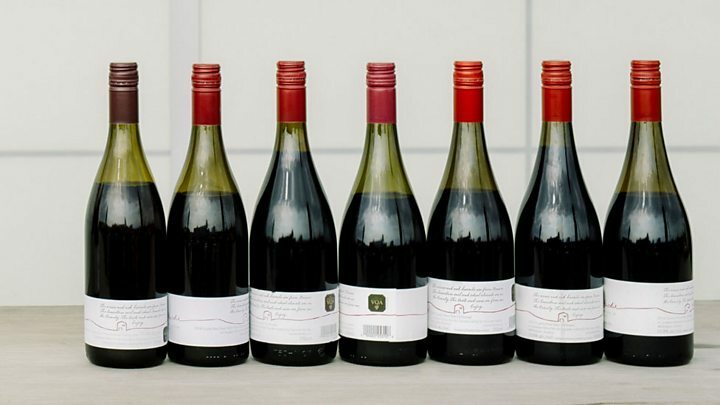 While most of us associate winemaking with warm countries, Mr Hardie has since 2004 been making wine in… Canada. Based in picturesque Prince Edward County, Ontario, a two-hour drive east of Toronto alongside Lake Ontario, the summers are more often glorious. The winters, on the other hand, are harsh, which means that the team at Norman Hardie Winery face a race against the cold weather every November. "I have 80,000 plants today, so that is almost a quarter of a million canes [the vine's branches] that we have to tie down by hand, and then cover with a mound of earth," says Norman. "Before we then carefully open up and untie in the spring." If that wasn't labour intensive enough, come April and May Norman and his team have to light fires and position wind turbines to try to drive away late frosts. But sometimes, such as in 2015, they just aren't that successful. Up against such challenges, you might question why Norman ever chose to plant vineyards and build a winery in Ontario. He says that despite the challenges, the combination of cool weather and the clay and limestone soil of Prince Edward County allow him to make world class wines. "The great wines are always made on the edge, and we're certainly on the edge," says South African-born Norman, who prior to going into winemaking had been a sommelier (wine waiter) in Toronto. "I'd rather be here than anywhere else in the world because the flavours we get out of these soils are unique." Primarily making white wines from chardonnay and red wines from pinot noir, Norman Hardie's wines now have a cult following in Canada, and are even said to be the favourite tipples of Canadian Prime Minster Justin Trudeau. But from day one, Norman - who studied winemaking in Burgundy, Oregon, California, South Africa, and New Zealand prior to establishing his own winery - wanted his wines to be sold internationally. This brought his next big challenge - how to persuade a sceptical world to take Canadian wine seriously, when even Norman admits that 30 years ago the country made "terrible wine". Norman's solution was to turn himself into a travelling salesman, and build up his wine's global reputation "one top sommelier one top buyer, and one top wine journalist, at a time… flying around the world, pounding the pavement, speaking to people, changing people's ideas about Canada". So attending wine fairs, visiting wine importers, and knocking on the doors of Michelin-star restaurants, he started to slowly build up export orders. This is the first feature of a new 20-week series called Connected Commerce, which highlights companies around the world that are successfully exporting, and trading beyond their home market. Focusing particularly on the UK and New York, Norman says his personal, face-to-face approach enabled him to let some of the most influential people in the global wine world "understand what we're doing, why we're doing it, and how we are doing it". He adds: "You can only do that with face time, and once you have them they are your evangelists." From selling 6,000 bottles in 2004, Norman Hardy Winery produced 240,000 in 2016. From that 6,804 bottles were exported across eight countries - China, Denmark, Japan, New Zealand, Sweden, Taiwan, the UK, and the US. And he still is regularly overseas promoting his wines, including spending five to six days every year in the UK. Back at the winery, there are now six year-round employees, rising to 50 in the busy summer months and at harvest time in late September and October. The business now has annual revenues of 4.1m Canadian dollars ($3.3m; £2.5m). John Downes, a London-based wine expert, who has the top master of wine qualification, says that Norman was right to recognise the fact that as Canada is such a little known wine region he had to do a lot of marketing work to "stand out" on the global stage. Mr Downes adds: "A lot of people in wine don't tell stories, they say 'here's my wine what do you think about it?'. "But they don't tell the story behind the wine, and that gives the picture of the wine to the consumer. Norman does that very well." While exporting wine is not without its challenges, such as the need to produce different labels for each country, Norman says that building up a vibrant export business has also boosted his sales in Canada. Now preparing to bury the vines for another winter, Norman says: "That credibility, that international credibility, says you're doing something right."